So should it be anyway. And there can be little doubt that violence of war is a major contributor to ecological and climate destabilization, not to mention the human and social horror of war. The UN reported this week that in it’s 70 years of existence it has never faced so many major (10) crises as it does now. Yes, we know there are alternatives to war and violence – see Jesus, Gandhi, King, Mandela, Day, etc. Yet we prepare constantly for war – see my blogs earlier this year, “Put Down the Guns”, or “A Race With All Losers” seemingly oblivious to the alternatives. I’ve been mesmerized and challenged by it for the past week. It has stirred me, as much by the subject matter, as by the pedagogy McCarthy brings to the topic. To read these letters is to feel a connection with fellow searchers for a better world. All teachers, at any level, should delve into its pages. Not since I read Parker Palmer’s The Courage to Teach, more than a decade ago has a book about learning touched me so deeply. It speaks to all of us who want to learn and to share knowledge and wisdom and make the world a better place. 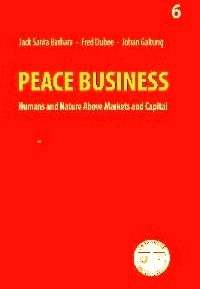 Couple this with Peace Business: Humans and Nature Above Markets and Capital which I noted in a recent blog, and one can awaken to the possibility of a world without war and violence. Peace business starts from a different orientation – not solely on making a profit but on meeting basic human needs. “These are human needs in their simplest and most universal form. The basic human needs of future generations are deemed as important as those of today’s population. This is in contrast to the current business paradigm where profit is the determining factor in whether a good or a service is provided. Surely, ending war will not be easy. Others have been trying for centuries. But slavery took centuries to end, and women and people of color have more rights and power now than they had 100 years ago, while we still have much further to go. All of these efforts began with those who believed in the possibility of changing the status quo. “War is a social, economic and ecological disaster. It is totally unsustainable and must be opposed by all who are concerned about meeting the real needs of all people and future generations. The effect of war is most immediate for those who are killed or maimed or made homeless, but the social and ecological consequences reverberate for generations. Among the children who survive, we still don’t know the full extent of the psychic damage they have suffered or the degree to which their problems are transmitted to successive generations. War is the ultimate atrocity that dehumanizes victor and vanquished alike; divorcing children from parents, separating families, smashing communities, it deprives its victims of their basic need for love and security in the company of their fellow beings.” [David Suzuki, quoted on page 4]. Perhaps we can begin to see the links between violence between humans and violence between humans and nature as two sides of the same coin. If we want to save the home we share with other beings, we must end war. We must. Starting Now. Colman McCarthy, Randall Amster, Johan Galtung, Jack Santa Barbara, Frederick Dubee have given us glimpses of possibilities. We must put our shoulders to the wheel.